Mitochondria are the last stop for extracting energy from food and oxygen. There are a multitude of reasons mitochondria may fail to perform efficiently, ranging from nutrient deficiencies to genetic mutations. Reactive oxygen species, from endogenous and exogenous sources, can be a significant challenge to mitochondrial function.1 The electron transport chain is one of the main producers of reactive oxygen species.2 Lab tests, combined with a thorough history and exam, are important in helping understand how mitochondrial function might be compromised and how to best direct potential treatment plans. 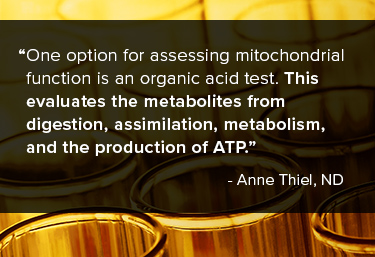 One option for assessing mitochondrial function is an organic acid test. This evaluates the metabolites from digestion, assimilation, metabolism, and the production of ATP. The preferred specimen is a urine collection; these metabolites are more easily extracted from urine than plasma.1 If one or more pathways is not functioning properly, the organic acids will "overflow” into the urine.3 A report may include 30-40 metabolites, including those from detoxification processes and gut flora. The organic acids ethylmalonate, adipate, and suberate are reflective of beta-oxidation. L-carnitine is necessary for carrying long-chain fatty acids across the mitochondrial membrane.4 If L-carnitine levels are inadequate, beta-oxidation might alternately take place in peroxisomes, creating elevated levels of adipate and suberate. Ethylmalonate, a breakdown product of butyrate, is also dependent on L-carnitine. Elevated succinate, fumarate, and malate may indicate inefficient energy production as they are part of mitochondrial oxidation.3 Markers that are indicative of carbohydrate metabolism are pyruvate, lactate, and beta-hydroxybutyrate. Metabolites of the citric acid cycle, some of which are mentioned previously, can also indicate variations in energy production. If mitochondria are not functioning properly or efficiently, cells may not be able to make adequate ATP to meet energy demands. Lab testing can provide clues to where inefficiencies or problems lie within metabolism. It is important to remember these tests are not diagnostic, but they can help guide treatment options and evaluate progress. Correlating digestive function is also an important part of interpreting mitochondrial function information. Anne Thiel is a licensed naturopathic physician who completed a hospital-based residency in naturopathic oncology at IU Health Goshen Center for Cancer Care. She is the owner of Progressive Wellness Naturopathic Care and is dedicated to helping women reclaim their inner wisdom and strength so they can lead healthy, productive lives. She is the senior research assistant supporting the Knowledge in Naturopathic Oncology Website, a project of the Oncology Association of Naturopathic Physicians. Dr. Thiel is also the treasurer for the Indiana Association of Naturopathic Physicians. 1. Haas RH, Parikh S, Falk MJ, et al. The in-depth evaluation of suspected mitochondrial disease. Molecular Genetics and Metabolism. 2008;94(1):16-37. doi:10.1016/j.ymgme.2007.11.018. 2. Alfadda AA, Sallam RM. Reactive Oxygen Species in Health and Disease. Journal of Biomedicine and Biotechnology. 2012;2012:1-14. doi:10.1155/2012/936486. 3. Grisanti R, Weatherby D. INSIDER’S GUIDE Interpretation and treatment: Organic acid ... http://www.functionalmedicine.net/pdf/insider's guide_37.pdf. Published 2008. Accessed June 5, 2016. 4. Sowell J, Fuqua M, Wood T. Quantification of Total and Free Carnitine in Human Plasma by Hydrophilic Interaction Liquid Chromatography Tandem Mass Spectrometry. Journal of Chromatographic Science. 2011;49(6):463-468. doi:10.1093/chrsci/49.6.463.